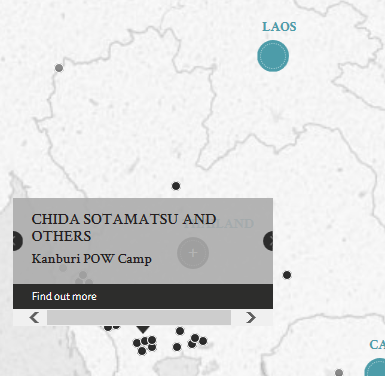 Allied POWs engaged in bridge building at Tamarkan, 5 kilometres south of Kanburi. 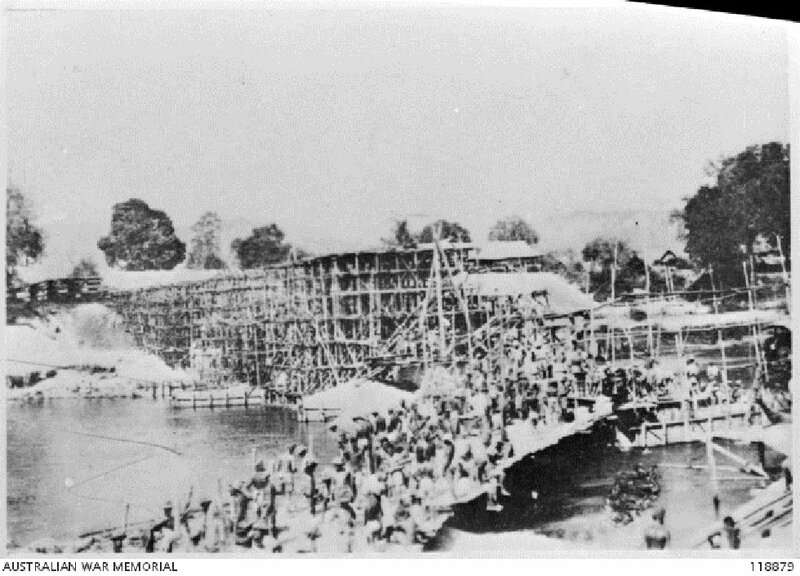 The bamboo scaffolding is at the site of the 11 span steel bridge which was completed in April 1943. Image taken February 1943, courtesy of Australian War Memorial. 29 August - 10 September 1943. 1 - 29 September 1943. 29 September 1943. The defendants faced various charges alleging that they maltreated and beat several POWs in their custody, resulting in severe suffering and injuries for six of them and the deaths of two others. Defence counsel complained to the court that defence witnesses should be dressed in apparel fitting their ranks, as it was customary in international law to allow officers to wear their badges of rank and decorations, and that even the Japanese permitted British officers to wear their decorations. However, the witnesses were not allowed to wear boots and Defence counsel claimed that they were presented in court looking like 'ragamuffins'. In response, the court granted an adjournment so they could be properly dressed. However, Japanese uniforms were not readily obtainable and the witnesses eventually gave evidence as they were originally dressed. Chida, Sotomatsu. Major. From Japanese military. From Japan. Not guilty on one charge, guilty on two others. 8 years' imprisonment. Sentence confirmed. Komai, Mitsuo. Captain. From Japanese military. From Japan. Guilty on three charges. Death by hanging. Sentence confirmed. Ijima, Nobuo. Sergeant Major. From Japanese military. From Japan. Guilty on three charges. Death by hanging. Sentence confirmed. Watanabe, Masao. Sergeant. From Japanese military. From Japan. Not guilty on one charge, guilty on two others. 1 day's imprisonment. Sentence confirmed. Urikawa, Yoshinaru. Sergeant Major. From Japanese military. From Japan. Guilty on three charges. Life imprisonment. Sentence confirmed. Watanabe, Seikeichi. Sergeant. From Japanese military. From Japan. Guilty on three charges. Life imprisonment. Sentence confirmed. Reilley, J.F. Captain. From British military. Solicitor. Brash, M. Squadron Leader. From British military. Barrister-at-law.